Here's a small test of several nice 200mm lenses. All of these lenses were quite expensive when new. 100% crops from the extreme corners (24MP FFJPGs direct out of the Sony A7). 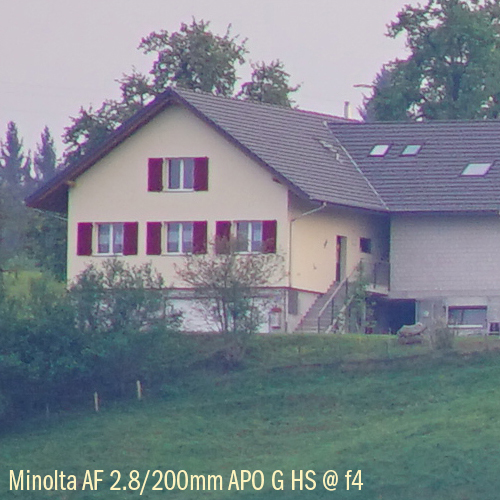 Minolta AF 2.8/200mm APO G HS: A well known and excellent fast 200mm from 1989, here shown at f4 for reference purposes. The two large front elements are made from Minoltas in-house "AD" glass which has a very low disperison (Abbé number 83.55), and a third element is made from LD glass (Abbé number 70). Its internal focusing works precise and without play. The lens is surprisingly lightweight (only about 790g) and small (134mm length). Mamyia Sekor C4/ 210mm: A rather unspectacular medium telephoto lens from around 1980. Available for very little money, but with a spectacular performance on 24 MP full frame: Even less CAs than the Minolta AF 2.8/200mm APO, and excellent detail resolution both at f4 and at f8. Not the fastest, but probably the sharpest lens of this little test. Nikkor AF 2.8/180mm IF-ED (newest version): Not as good as i might have expected. Certainly no match to the Minolta AF 2.8/200 APO, even though the Minolta test shot was at f4 and the Nikkor test shot shown here is at f8! Quite visible CAs and corner resolution not as good as with the Mamiya or the Minolta. Konica Hexanon AR 3.5/200mm: A massive and well-built lens from the mid-1970s. Its construction is more Sonnar-like, and so is its performance. Relatively low CAs (for a non-ED-lens at least), and good resolution. Pentax SMC 2.5/200mm: Large and fast lens, but obviously without ED glass. Focusing only to 2.5m (which is a bit a pity since it would be a nice portrait lens). low contrast wide open, but good resolution though. Even at f8 - as shown here - not comparable to the Minolta at f2.8 or the Mamyia at f4: Both these lenses are better wide open than the Pentax at f8! Canon new FD 2.8/200mm IF: Slim and lightweight lens with internal focusing - a pioneer among the 200mm lenses! Its optical performance however is not up to the standards of Canon L glass. At f8, resolution is still quite low, and CAs are well visible. Due to its focusing range (down to 1.5m) a nice portrait lens. Its CAs are pretty hefty, and focusing is not as precise as with non-IF lenses (the same is true for the AF Nikkor 2.8/180mm - the Minolta AF 2.8/200mm APO, however, has a more precise IF mechanism). We can an assume that the nFD 2.8/200mm has two large lenses out of LD glass (Abbé number 70) - at least the nFD 4/200mm, nFD 4/200 Macro, and the nFD 4/300 (non-L) do have them. Obviously this is not sufficient to give a good color correction.